As part of implementation of its Gender Mainstreaming Policy, the Malawi University of Science and Technology (MUST) on January 14, 2019 held a student gender based violence (GBV) awareness. The function involved a presentation of a GBV study findings from Chancellor College of the University of Malawi. The presentation was made by lawyer and country coordinator for Women and Law in Southern Africa (WiLSA) Malawi, Mzati Mbeko, whose organisation carried out the research at Chancellor College with other partners. There were also student activities that included music and poetry, all with messages on the dangers of GBV, especially at an institution of higher education. In his presentation, Mbeko shared the various forms of GBV common at an institution like MUST and how best to deal with them. Students also had time to ask questions so as to gain more understanding of issues of GBV. 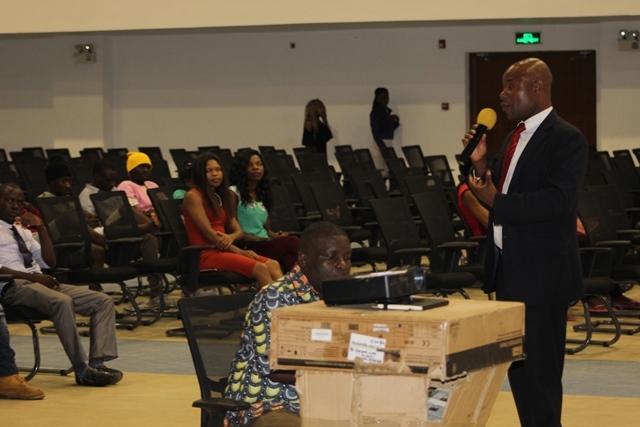 In his speech, MUST communications manager and a member of the policy implementation taskforce, James Mphande, explained that the university wants to create a conducive environment for learning and teaching and one area is to ensure that there is no gender discrimination of any sort, including cases of GBV. “We are grateful to UNDP who provided funds for the development of the gender mainstreaming policy and the Ministry responsible for Gender for their technical advice. We now have the policy approved by Council and we are in implementation phase. The activity today is one of those outlined in the policy to ensure that you are aware of GBV, its various forms and that when victimised, you know what to do,” said Mphande. He said as students spend long periods in lecture rooms, they needed to incorporate entertainment into the activity so that the menu becomes palatable and easy to swallow and digest. Malawi’s top urban musician Piksy was the main headliner during the event and he performed after the presentations. Some students also entertained their colleagues with performances pregnant with GBV messages. MUST Student Representative Council vice president, Chimwemwe Kawoloka, who is also a member of the implementation taskforce, said the university invited Piksy not only to entertain them but also to help disseminate anti-GBV messages. “Students danced to Piksy’s songs after learning how they can handle issues of GBV on campus,” she said.